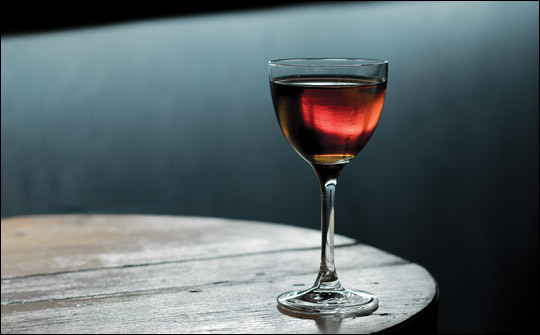 Often heralded as the precursor to the Martini, the Martinez is a combination of sweet vermouth, gin and sweet liqueurs. The story goes that over time, as modern palates moved away from sweet towards dryer flavours, the sweet vermouth was replaced with dry vermouth and the Martini as we know it was born. The transition probably had something to do with the quality of the gin too; this improved as distillation methods evolved and there was less of a need to mask poor quality spirit with sweeter flavours. Nevertheless, a well-balanced Martinez is a wonderful cocktail and a great pre-dinner choice. If you find that you like it, you should also check out the wonderfully named Hanky Panky, created by Ada Coleman at the Savoy back in 1900s for actor Sir Charles Hawtrey. While the story of the Hanky Panky was well documented in newspapers at the time, and is directly attributed to Ada Coleman, how the Martinez came to be is debated, and you can find differing recipes throughout historical cocktail books with many different formulations touting to be the classic. Over the years I’ve therefore tried plenty of the recorded recipes, involving different combinations of the various possible ingredients, ratios of gin to vermouth, and the types of sweet vermouth to include. I’ve also tried recipes which call for just dry vermouth, just sweet vermouth, or a combination of the two (akin to a perfect Manhattan). It’s amazing how different some of these drinks can be, especially when it comes to the quantity and type of vermouth. The recipe here, therefore, is my preferred Martinez recipe and follows the formula most commonly identified as a Martinez. The key to a Martinez, as with a Martini, is to make sure that it is served very cold. Add all ingredients to a mixing glass, jug or vessel large enough to house plenty of ice and with a large enough aperture for easy stirring. Add ice, and stir with a bar spoon (a chopstick also works a treat). Strain into a chilled Martini glass or coupe and garnish with a small disc of orange zest.